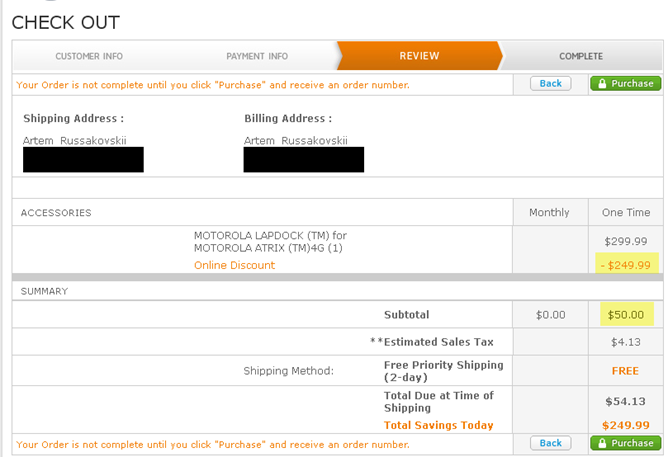 The Motorola lapdock for the original Atrix 4G is being blown out of the AT&T store starting today for $250 off its $300 list price. Yup, just $50 after an instant discount gets you a laptop shell with a 36Wh battery inside. Plug your Atrix into it, and the dead frame comes alive with a desktop-grade Webtop experience (it's really a custom, though severely cut down, Linux flavor), including desktop Firefox and virtual access to your phone's screen and data while docked. Now that the Atrix 2 is out, AT&T is likely seeing a huge drop of demand for the now obsolete OG Atrix, and nobody likes being stuck with a large stock of unsold and highly overpriced accessories of questionable value. After doing some research, I found the dock's price to be $194 at Amazon and, brace yourself for this one, $500 in the Motorola store, which is hilariously also powered by Amazon. 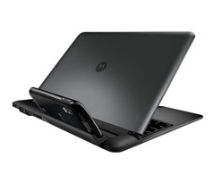 $500 is how much the lapdock originally cost in the beginning of the year, and it looks like Motorola either can't be bothered to update its store prices due to lack of giving a crap or really is this greedy. Either way, I'm shaking my head here. But back to the deal at hand. My last word of caution - be sure you're OK with this fine print before you pull the trigger: "Full Firefox browser use with AT&T Mobile Broadband requires DataPro 4GB plan." While there should be workarounds for this floating on xda, you normally won't be able to use Firefox without Wi-Fi unless your plan has DataPro 4GB. Capisce? Then carry on to the AT&T store and grab the lapdock for $50 while it's still in stock.